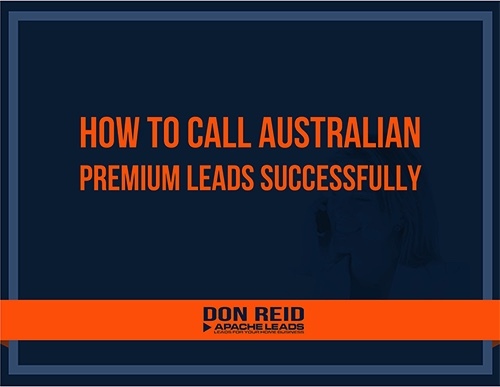 First, if you have not seen Don Reid explaining why these leads are different from all other leads, then please watch it now. We really want you to get the best from your investment in these leads. These leads were generated by completing a survey form on the internet some time in the past. The next step was we called them on the phone and interviewed them. If you care to read what we said and asked of them, you can open the script in a new window here. When fresh (0-72 hours old) these leads are of the highest quality and are designed to be called as soon as they are delivered to you. They are the only Phone Interviewed Australian MLM Leads in the World, guaranteed! Please note the primary goal of calling ANY lead is NOT to tell them about your business and sound like every other desperate network marketer out there. The primary goal is to determine if the lead even qualifies to hear about your business. Many will not. When you do determine they qualify, next you want to be listening to what they say. Drill downuntil you really find their goals and dreams. For example if they say they want to get into business for money don't stop there. Drill down. Ask them, what do you want the money for Mr Lead? Whatever they answer drill down more. "I want a house on the beach" Great, which beach? How many bedrooms? What color is the house? Does it have a big shady veranda facing the water? Recruiting leads begins with building a relationship of trust. The prospect needs to believe that you are the one who will show them the way and be there every step of the journey. They do not get into business because of the products or the comp plan. Of course we wont let you go out there without a guide. So go download this book to discover how we recommend you call your leads! You like it? Well why don't you check out the rest of the resources here. I'm sure you will find something that will suit your needs.